Whether it’s before, during, or after cancer treatment, nutrition plays a critical role in a patient’s overall health. Certain foods, especially fresh fruits and vegetables, can help increase energy levels, support the immune system, and manage side effects. 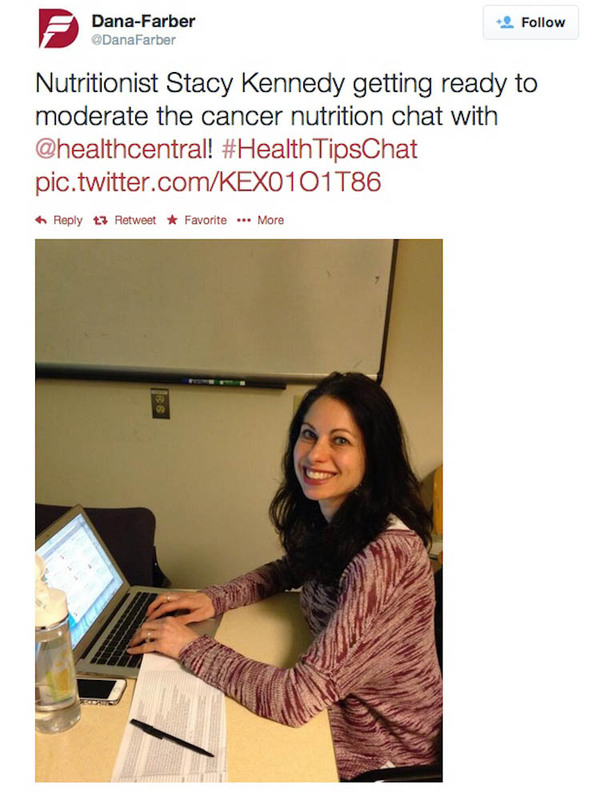 Dana-Farber (@DanaFarber) and HealthCentral (@healthcentral) hosted a live Twitter chat on nutrition and cancer on March 12, 2014. The chat featured Dana-Farber nutritionist Stacy Kennedy, MPH, RD, as well as a large group of hospitals, nurses, dieticians, doctors, and patients. Some of the topics included tips for maintaining a balanced diet, how to manage side effects with food, how to lose weight in a healthy way, and information about vitamins and supplements. Scroll through the Storify below for some highlights from the cancer nutrition chat and tips on how you can start a healthy eating routine. For more information on cancer nutrition, including healthy recipes, visit the Dana-Farber/Brigham and Women’s Nutrition Services website or view our Eating Well During Cancer video series. A full transcript of the Twitter chat is available here.